Fish aren't the first thing you think of when you think of a snake's dinner...but it happens. 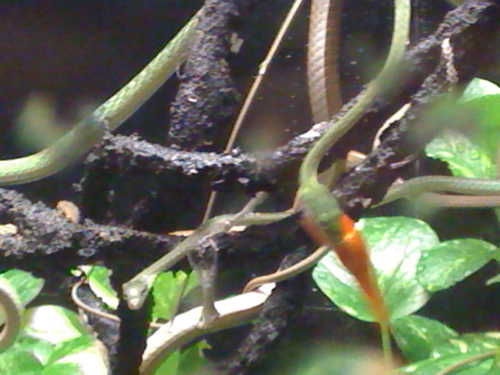 Here's some pics I snapped at the aquarium of a Burmese Vine Snake (Ahaetulla fronticincta) munching on a fishy lunch. Pardon the blurriness...some bite readjustment was happening. So cool. 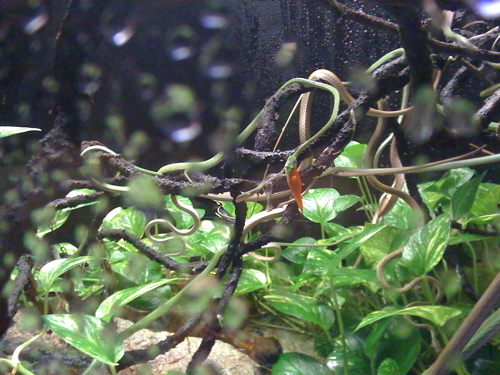 I watched a few of these snakes catch lunch, and then of course had to wait and watch them get the fish into their bodies...so awkward...and lumpy. Speaking of animals, you must watch this short film. It's hilarious and you'll probably watch it 50 times and you'll probably sing it and quote it for at least a week. You have been warned. Huge thanks to Diane and her sweetie for sharing this delight.